Kelly grew up in the mountains of Vermont in a ski lodge owned and operated by her family. She made her way to Wake Forest University in North Carolina as a Division 1 NCAA scholarship athlete. Through competitive and rigorous athletics, Kelly discovered the invaluable healing and rejuvenating power of quality body work. After graduating college she attended the Colorado Institute of Massage Therapy and graduated with an International Certification in Neuromuscular Therapy as well as certifications in trigger point, deep tissue, prenatal and Swedish massage. 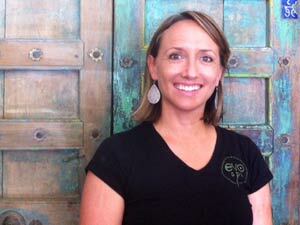 Kelly had been practicing massage for 9 years in Boulder, CO until her recent move to Marin county. She continues to find deep meaning and purpose in every session and stroke. Over her years of practice, Kelly's massage technique is an integration of different modalities, all centering around deep, slow strokes that release muscle and connective tissue stresses. Slow movement and making every stroke impactful is the philosophy behind her work. There is no one 'routine' that she does time after time or one type of session. Depending on the clients' individual needs, every session is unique and practiced with intention and focus. Kelly is continually discovering how present moment awareness creates a powerful and healing bodywork session. This remains her intention as a massage therapist here at Evo Spa.